Eggs of many birds are pointed at one end so that they do not roll off from the nests located on an uneven surface. This conclusion was made by biologists who observed the life of Arctic birds and published their findings in the Journal of Experimental Biology. “We found that the differences in the size of the dull and sharp end of the egg had the strongest effect on how quickly it slides down an inclined surface, which explains why the guillemots and many other birds nesting on rocks and steep banks lay very asymmetric eggs,” “Says Mark Hauber of the University of Illinois in Chicago, USA. Eggs of many birds, unlike crocodiles, dinosaurs and other reptiles, often have a conical and very elongated shape. 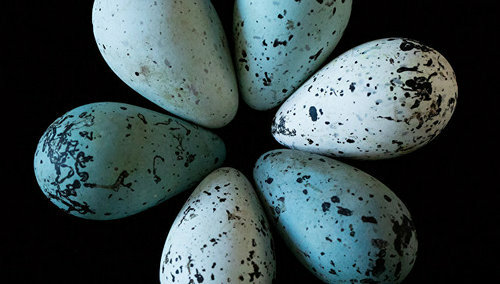 How this peculiarity of eggs arose and what role it played in the evolution of birds has long been troubling not only the Lilliputians of the Gulliver, but also the evolutionary scientists. For example, recently they found out that the overall shape of the egg and the extent of its elongation does not depend on the size of the bird, but on how well it can fly and how often it does it. Such discoveries made Hauber and his colleagues think about how differences in the size of the dull and sharp end of the eggs could have occurred during the evolution of birds. Comparing the clutches of different birds, scientists drew attention to the unusually pointed eggs of thick-cocked guillemots, similar in shape to the pear. The guillemots live beyond the Arctic Circle, setting up giant colonies on steep cliffs located on the very shores of the Arctic Ocean. During the breeding season, they form couples and lay eggs directly on the rocks, arranging the nests at the very edge. This fact led scientists to the idea that pear-shaped eggs of guillemots can help them stay in place and not slip into the abyss. They checked to see if this was actually the case, printing on the 3D printer several dozen models of guillemot eggs and other birds that have a more “symmetrical” shape. As it turned out, pointed eggs are much worse sloped from inclined surfaces than their more round “competitors”. Interestingly, long and “thin” eggs slipped much better than the rest of the plaster casts, but such characteristics influenced the probability of their “escape” from the nest much less than the difference in size between the blunt and sharp end. Similarly, according to Hauber and his colleagues, evolution could also affect other properties of eggs, including the size of the yolk and protein, the total mass of eggs and other properties that undetectably affect whether the offspring of the bird survive or die. Further study will help scientists uncover the secrets of how feathered dinosaurs turned into birds and in what conditions they lived.